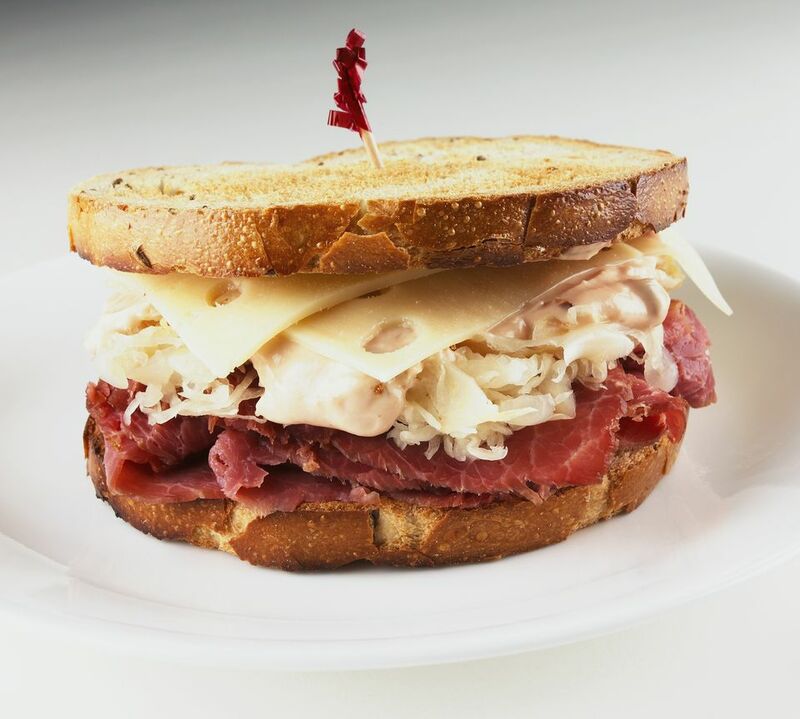 Most people typically enjoy corned beef sandwiches on St. Patrick's Day, but there's no reason not to have the signature flavors of corned beef, sauerkraut, and Swiss cheese any time of year. Try this recipe for an easy corned beef and sauerkraut sandwich. This corned beef sandwich is topped with sauerkraut and Swiss cheese. The meats are put on a flavorful rye bread that is slathered with mustard for even more savory flavoring. This is essentially a Reuben sandwich; which is an excellent way to use sliced deli corned beef or leftovers from a traditional St. Patrick's Day celebration. There are a few variations you can also try (read on) such as changing up the type of bread of cheese you use. On a slice of dark rye bread, arrange a layer of Swiss cheese, a few slices of hot corned beef, and sauerkraut. Spread with your favorite mustard and top with another slice of dark rye. Slow-Cooked: Pop your corned beef in the crockpot with spices and water and let the slow-cooker do the rest. It will create a tender, juicy corned beef that can be sliced and put on sandwiches, or eaten plain. Boiled: With this method, you put the corned beef into a large pot or Dutch oven along with spices that come in the package_ and plenty of water. Boil it and then reduce the heat to simmer the corned beef with a cover over it. Oven Braised: Place the roast in a Dutch oven or roasting pan and bake it in the oven with aluminum foil on top to keep it juicy. Toast the bread before making the sandwich, or bake the entire sandwich in an oven. Use white bread, wheat or pumpernickel bread. You can put this on a roll, too! Replace the Swiss cheese with Cheddar, Muenster, Fontina, or Gouda for a different flavor profile. Add some bacon to the sandwich. Instead of plain mustard, use Dijon mustard or a spicy Sriracha mayonnaise, or mayonnaise mixed with Dijon mustard. It will add a tangy sauce that goes beyond the ordinary.